I was, in my opinion very lucky to be given a Subaru Brat (or just Brat) back in 1983. For those that remember cast your mind back to the that time and see what else was available. the Rough Rider/ Sand Scorchers etc where 50% more expensive. The XR311 / Cheetah's where very detailed and fragile - and you had your road cars. The Brat came along at the right time offering a durable, easy to build and strong detailed buggy for a fraction of the cost. I've always liked the proportions of a truck body and as such the Brat was an obvious choice. The space frame chassis was all new, with independant suspension all round. 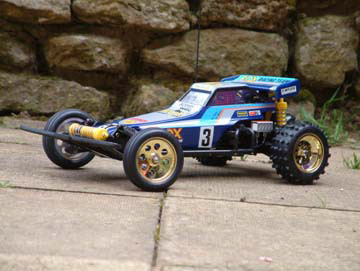 It had the familar soild rear diff and the long lasting (with a 6v battery) 380 motor ! nothing fast but again think back to what was about. 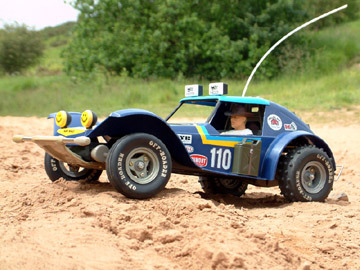 There was nothing to compare, I raced mine with my mates also 380 powered Holiday Buggy and while he had the 7.2v battery so was faster the Brat was so much more durable. The amount of times he had to go to the model shop for chassis parts or suspension bits but the Brat kept going and I gave it massive abuse. 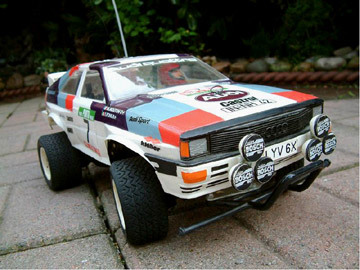 Don't get me wrong the Brat has it's faults mainly the rear arms - Tamiya chose to use plastic arms in a rough alloy casting - wear was inevitable giving a sloppy feel to the rear suspension and rear dog done driveshafts that would wear and pop out. The body again highly detailed but you wont find many runners that have the rear mounts still in tact on the bodyshell!. The front and rear body sections always come adrift but if you follow the manual they tell you to glue it and if you do they last far longer. The early Brats have a few differances as follows, the front bumper was narrower, no holes in the chassis for the skid plate (as fitted to the later Frog) the front bumper mount didn't have the Frog body mount post and finally the early editions had wide offset front wheels which made the original model have wheels at the front stick out further than the rear. This was changed on later models. Heaven in a cardboard box is how l would describe the Brat. Naturally though it didn't stay in the box for long and on the 23rd July 1986 l ripped apart my dead Wild One and ripped apart the packets inside a Brat box. The chassis is a design feat that has stood not only the test of many kids and racers but also that of time. 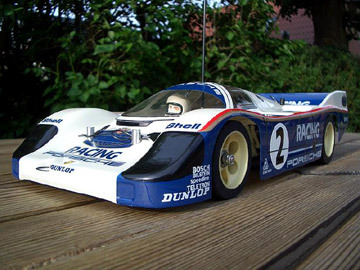 From the moment it sold this single mould has stayed with Tamiya for more than 20 years. 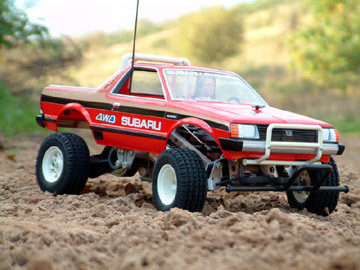 With the re-release of the Brat Tamiya has come full circle with A parts 0005351 in 24 years. The appendages may have changed but the chassis stayed true to its original concept. Despite its looks the chassis was a breeze to build and looked beautiful. It had no vices but the bits attached to it did. Tamiya still chose to used pressed parts and the trailing arms attached by part of the gearbox and an O-ring mount would soon wear them and alter the angle of the rear wheels. This would also cause the tires to wear on the inside too. The double wishbones at the front wore a little better and any adjustment was taken up by tightening the nut on the radius arm. The body was a feast for the eyes. In my "yoof" l painted mine black so l wouldn't have to waste time painting the details. l rushed the body and stuck the decals over a tacky to the touch body. It didn't look great but with the aid of some polycarbonate white and an orange marker l made it look a little better. Worse than this was the driver had a glossy orange jacket and glossy orange hair. As time has gone by and l have restored more and more Brats l can honestly say that the body really is a delight to paint. It's difficult, it's tricky, it takes a painstakingly long time to do but all done correctly it makes the car and 1, only adds to the enjoyment of the car be it that you use it or shelf it and 2, helps with its resale value. Probably the most difficult part of a Brat build up is choosing the colour. Most people opted for red but for those who let their hair down were guaranteed a great looking truck regardless of what colour they painted it. Driving the Brat was great and probably the best looking RC car at the park. For a top heavy looking pick-up it handled really well and even though it only had some loose wish bones at the front and springs on the back, it soaked up the bumps really well and was controllable on most surfaces. And once the 380 was discarded for a proper 540 motor it was a hoot. One can't dismiss the 380 though, if scale driving is your thing and you like to get the most out of your running times this was a fun way to waste 40 minuets of your life. For a time parts and complete cars though plentiful had started to increase in price but prices have now dropped with the advent of the re-release. But to me it will never be a true Brat. I've built a few and though it looks like the original, it has something lacking and for those never fortunate to build or restore an original I'm sorry but you've missed out. One of my fave Tamiya's! Had one as a kid & thrashed it to death like ya do. Even in standard form they go well, 380 motor is slow, but fun in the right place. The whole look of the Brat I adore. The way it sits right down at the front corner when turning hard, The flow of the rear over a few bumps. Superb! The body is detail heaven! Not as detailed as say a Scorcher, But not far off. If it had glass lights & ya could put bulbs in.. Oh yes! Not many would have done all the detailing either when they were kids, I think I did as I have some old photos. It does look good done right. But my word, It's one of the hardest bodies to do detail wise. Loads to painting!! Prices are still high, A good runner will set you back around £80-£100, New built ones double it & ya can see where it's going with the NIB's. Only truck I know with 4WD on it & it's 2WD..